We are delighted to announce that the Agecroft Annual Dinner is due to take place on Saturday, 21 January 2016 at the Midland Hotel, Manchester. This is the key social event in our calendar and we hope to see members old and new joining us for a celebration of the previous year's achievements and looking forward to our future successes. More details to follow soon. Watch this space! Agecroft Annual Dinner took place on Saturday, 23 January 2016. Thank you to the Events Committe who put on an amazing evening with pictures from the season from all the squads projected on a massive screen at the Lowry Hotel. Come down to Agecroft for our fun night where fine drinks and nibbles meets rowing banter. Our Men's Development squad are hosting the event. Joanne Kain, a past Agecrofter herself, will provide the tasting notes. All you have to do is show up and eat and drink! Food will be available and we will be providing a minimum of one bottle of wine per person, as well as a glass of bubbly on arrival! So get your tickets for £20! Sales close Friday morning! 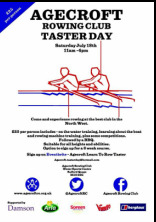 Following the success of our Taster Day on the 18th of July, we are delighted to announce that our Learn to Row Course starts at 10.30am on Saturday 1st August 2015. See our Learn to Row page for more details. At an ungodly hour of the morning of July 29th 2015, a band of hardy Agecrofters (Aaron Jackson, Ben Charles, Matthew Bucknall, and Ali Chapman) will set off from Lechlade to cover the 150 miles of the Thames to London in an open rowing boat. Endorsed by British Rowing and ourselves here at Agecroft RC, the team are aiming to overcome miles, locks, blistered hands, and sore legs and backs to finish as close to Tower Bridge as time, tide, and the Port of London authority will allow. They'll be taking nothing with them but a change of kit and your support. Their chosen charity is Kidney Research UK. Kidney Disease is common in the UK, often remaining undiagnosed and untreated because there are no outward symptoms until the disease is significantly advanced. Aaron himself was diagnosed with Chronic Kidney Disease and Acute Focal Segmented Glomerulasclerosis following routine blood tests and he has learned how, with the support of family, friends, and the wonderful doctors and nurses of the NHS this condition can be managed and moderated, and he can even row 150 miles with his friends! Read more about Aaron's story and motivations on his Just Giving Page. So please think about donating if you can. With your support, the miles will go a little easier for our Agecroft team. We wish them lots of luck for the day! Come join us at our Taster Day on 18th July at 11am until 4pm, followed by a Club BBQ. For more details see our Learn to Row page. We look forward to seeing you!